When Abraham’s servant started out to look for a wife for Isaac, he prayed for divine guidance. He needed it. A man looking for a wife for himself needs all the light he can get. This man was looking for a wife for somebody else! Later on he said, “I being in the way, the Lord led me…” (GENESIS 24:27). I grew up in the North Carolina hills. From our front porch we could see at night the lights of five little towns. From the back porch one could see Grandfather Mountain, Table Rock, an companion peaks standing like sentinels along the western skyline. My home community was called Jugtown because in the early years there were little shops up and down the road where the potters wrought vessels of clay. I lived the simple, happy life of an old-fashioned country boy. I tramped the woods with a shepherd dog. There was plenty of outdoors, and all the plain joys of rustic youth uncushioned by modern conveniences. It would drive a teen-ager frantic these days but I thrived on it. Father was an austere but devout Christian, the pastor’s right-hand man at old Corinth Baptist Church. The country preachers always stayed at our house on Saturday before the fourth Sunday in each month, when they came by horse and buggy to preach the monthly sermon. Some of those sermons were long enough to last a month and sounded more like filibusters-but it was sound preaching. Father always let me sit up late on those Saturday nights, before the open fire, and listen to him and the minister talk about the things of God. It beat all the television that has been seen since. Father should have been a preacher. Two of his brothers did preach; one as a Baptist, the other as a Methodist. Mother was a gentle, kindly soul content to be a housewife. Her life as a “keeper at home” would be anathema to the emancipated woman of today. I grew up with a Bible in one hand a bird book in the other. Pilgrim ‘s Progress. Foxe’s Book of Martyrs, and a set of good classical literature formed our library. I never knew the day when I did not feel that I should preach and write. I memorized Bible portions, made little Sunday School talks, and sent my first “sermon” to our small-town newspaper when I was nine. When I was ten, I professed faith in Christ. A revival was in progress at Corinth Church, but I came to Jesus alone in the woods. Always following an unbeaten path, I did not got to the mourner’s bench as the custom was, but made my decision in a solitary place. There was no dramatic experience such as some can relate; I came as a child in simple trust. I did not understand all about the plan of salvation. I do not understand all about electricity, but I don’t intend to sit in the dark until I do. I was baptized in the South Fork River and a year later I asked the church to license me to preach. I began with a talk at the First Baptist Church of Hickory, twelve miles from my home. I have been in bigger towns and churches since, but none looked as large as did Hickory that night. Dad and I went over in an early Ford with thirty horsepower-twenty of them dead. I stood on a chair and spoke while the pastor of the church stood on one side and the state evangelist stood on the other: like Aaron and Hur holding up the hands of Moses. For several years I preached on Sundays in town and country churches as a boy preacher. Of course, crowds came out of curiosity. Then I went to a Baptist boarding school called South Fork Institute. I was not a star student, but often sat listening to a bird singing outside rather than to a professor teaching on the inside. I went next to what is now Gardner-Webb College. It was during the First World War. We were singing Tipperary and Over There, and girl students wept as boy friends left for camp and for France to make the world safe for democracy. It hasn’t been safe for anything since. The principal of this school advised me, one day, to blaze my own trail instead of following the prescribed course of ministerial training. He told me that I was no genius, but would do well to follow an unbeaten path. I went on to Catawba College for a year, then to Wake Forest. I was restless and wanted to preach. One day, I packed my belongings and left. A professor saw me at the railroad station and said, “Young man, you’ll regret this.” I haven’t regretted it yet. I am not advising others to follow that course, but I believe it was best for me. I started preaching again, but without guidelines or precedent for my kind of ministry. I made many mistakes, went up blind alleys and dead-end streets. I took a rural pastorate in eastern North Carolina. I became somewhat enamored of the liberal approach which was beginning to gain favor. It did not become malignant in my case, but I did have enough of the virus in my system to preach popular sermons that convicted nobody. The unbelievers liked my preaching and I had a good crowd, but many of them died unsaved under my ministry. I resigned after one year and returned to my old home in the hills. Father died that winter, leaving mother and me with a grocery store which was robbed and burned one night. The Lord made it clear to my heart that if I would preach the old message I had proclaimed as a boy, He would make a way for me. I remember reading J. Gresham Machen’s Christianity and Liberalism out in the woods to my great profit. I returned to the old message, and the first thing I had to do was go back to my country pastorate and preach it for three years. I studied my Bible, tramped the country roads, and laid a good foundation for the years to come. No preacher has had complete preparation who has not been pastor of a country church. It still affords, even in this insane age, some opportunity for meditation and reflection in solitude, that lost art of the modern ministry. From 1934 to 1939, I was pastor of the oldest Baptist Church in the South, the First Church of Charleston, S.C. I shall always treasure those five years in that quaint, historic old city. Many blessed experiences were mine, especially a stirring of my heart as to the filling of the Holy Spirit. I was brought to a new dimension by reading Deeper Experiences of Famous Christians. 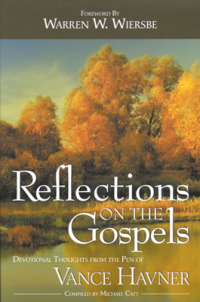 In my country pastorate, I had written my first book, By the Still Waters. I wrote for the Charlotte Observer and for religious publications. One of them, Revelation, edited by Donald Grey Barnhouse of Philadelphia, was helpful in opening doors up north for Bible Conferences. Mood Bible Institute’s Founder’s Week, Winona Lake, Montrose, Maranatha, Pinebrook, Canadian Keswick, and on the West Coast, the Torrey Conference in Los Angeles, Mount Hermon ad the Firs-these, and many more, eventually appeared on my itinerary. “I being in the way, the Lord lead me.” No man with God’s message need politick, nor pull wires, nor sit hunched over cafeteria tables making contacts, nor wait for some talent scout to find him. He need not chase key men around, if he knows the Keeper of the keys! So many calls came that I left Charleston and took to the road in 1940. I was in a low state physically, for I had been suffering from nervous exhaustion for two years, and a traveling ministry seemed the last thing a preacher in my condition should undertake. It meant getting adjusted and yet never getting adjusted week after week to different beds, food, climates, environment, and continually rising to the occasion. Yet the way had opened, and I could only go forward. My first engagement was with the Mel Trotter Mission Bible Conference in Grand Rapids. I got as far as Chicago, came down with the flu, and wound up in a hospital. The devil sat on the foot of the bed and laughed at my discomfiture. The doctor told me to go south. I wired the Florida Bible Institute and accepted an invitation I had declined earlier. There I recuperated, and met a gracious little lady who became my wife and has meant more to me than anyone else on earth. The Lord knew I needed to go south instead of north! Also, in that school I met a lean, lanky student by the name of Billy Graham. we had our pictures taken on the campus. Twenty years later, we posed for another snapshot. What God wrought in twenty years! From Bible conferences all over the country, and from church revivals, I gradually became occupied almost full time with my own denomination, the Southern Baptists. I had been a Southern Baptist since I was a boy, except for a brief time when I was a member of First Baptist, Minneapolis, Minnesota, while Dr. W. B. Riley was pastor. Dr. Riley baptized my wife who had been of the Quaker persuasion. I was on a program with Dr. W. A. Criswell of First Baptist, Dallas, in a conference held in the old Baptist Tabernacle of Atlanta, Georgia. Later, I was invited to the Texas Evangelistic Conference for 1949, meeting in First Baptist Church of Dallas. Thus began a new field of ministry in evangelistic conferences, as well as church revivals, all over the convention. A serious illness in 1960 almost took my life. After major surgery, a blood clot brought me to the door of death. A fine Christian nurse sat by my bed all that night, at her own request, praying and watching. Prayers went up all over the country from Moody Bible Institute to the Florida Baptist Evangelistic Conference where I was to have been speaking. Billy Graham called my wife that night from Miami to say, “We had prayer for Vance and I told my wife that I believed the Lord would let Vance live awhile longer to prepare sermons for the rest of us to preach!” The Lord definitely healed me, and after five months out of the pulpit, I started again in First Baptist of Houston, Texas. Today, after twenty-seven years on the road, fifty-two years in the ministry, and twenty books, I can only marvel at the way God has gone before me in this journey from Jugtown. Abraham’s servant, when he found the wife for Isaac, was invited to linger ten days, but he said, “Hinder me not, seeing the Lord hath prospered my way…” (GENESIS 24:56). I am resolved to make that reply when any subtle suggestion arises to take it easy and relax on my heavenly errand. When God has prospered man’s way, he had better be on his way! All the way my Saviour leads me. Retirement age is supposed to mean that I should sit in a rocking chair, wait for my social security check, and reminisce about the good old days. I have no thought of retiring. I would say with Caleb, “… give me this mountain… “! (JOSHUA 14:12). I am not asking for molehills. Old soldiers need not fade away. I have asked like Hezekiah for an extension of time; like Jabez, for an enlargement of coast; like Elisha, for an endurement of power. Caleb did not suffer, like the ten frightened spies, from a grasshopper complex. Too many cowards are cringing before the giants of Anak. God give us Calebs looking for mountains to conquer! Pingback: Revival, Simply Put, Is… | Pray for Revival! Pingback: Revival Simply Is… | Pray for Revival! Pingback: Revival Begins with Repentance! | Pray for Revival! Pingback: Joyous Singing Does Not Bring Genuine Revival… | Pray for Revival!